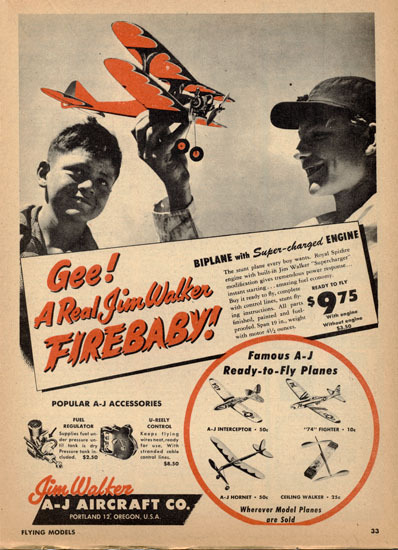 Here you will find interesting photos and items dedicated to Jim Walker's Firebaby. 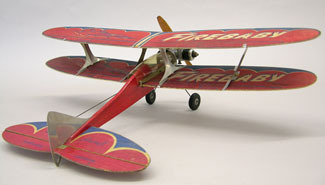 Here is the Firebaby Biplane, notice the same freckle faced kid. Here is how most of us would have purchased our Firebaby. 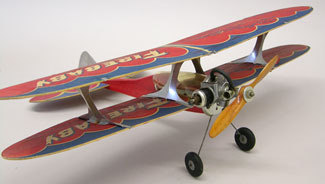 A "suitcase" version was available, ready to fly. The first speciality item we have is an extremely rare recording of a radio spot for the Firebaby. 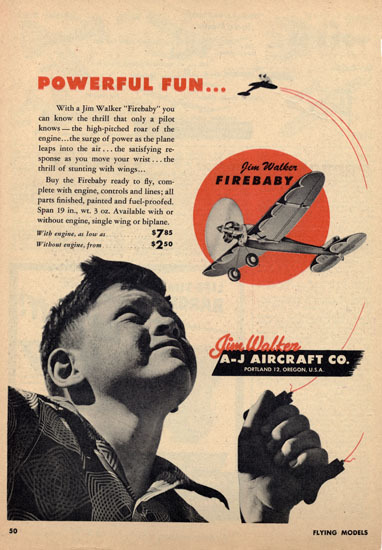 This radio spot was produced in Portland, Oregon probably around 1958, as there is a dedication to the new flying field, located in Delta Park in the honor of Jim Walker. You can almost picture the two kids flying their Firebabies as you listen to the recording. We hope you enjoy this A-J Classics exclusive. The original recording was a 78 rpm record and is made available to us by Jim Walker's daughter, Valerie. We wish to thank her and both of her sisters, Marilyn and Joan for the use of this family archive. 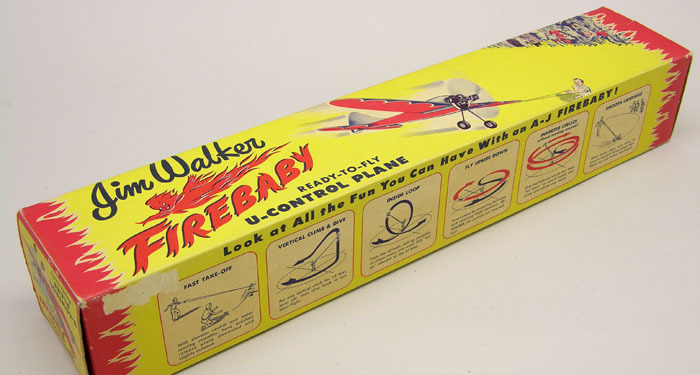 A-J Classics Exclusive: Listen to a Firebaby Radio Ad, circa 1958. 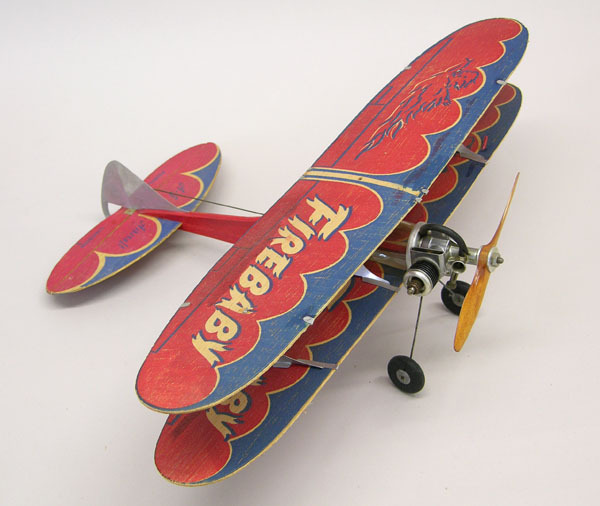 Here is the Firebaby Biplane that came with a Royal Spitfire engine. 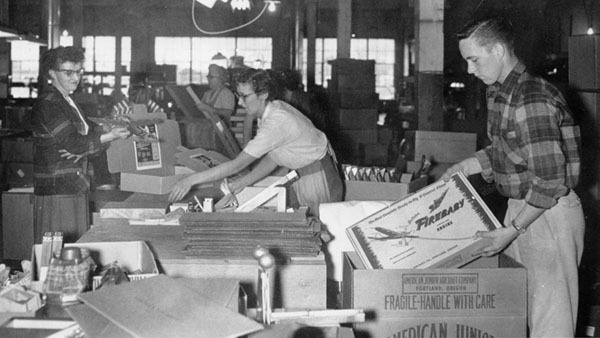 Employees at the American Junior factory packing the ready to fly "Suitcase" version of the Firebaby.